That�s what the top 10 companies in this year�s BT-500 are doing: changing radically to stay where they are. On top of the value-listings. But money and an opportunistic bent of mind aren�t the only things they�ll need to do so. A take on sectors and companies to watch from the people who watch the market for a living. A neck-on-the line opinion of what the BT-500 will look like in 2005 (hint: it�ll have MNCs, dot.coms, and ex-PSUs). A sectoral analysis of the 500 that doesn�t throw up any surprises. Technology, media, and telecom are the three kings. The methodology behind the BT-500. 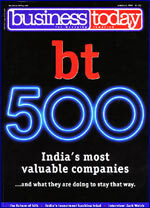 The BT-CMIE listing of the top 500 companies by market capitalisation, along with key financial data. Plus one on the most valuable PSUs. If numbers are your thing, feast your eyes on a graphical rendition of the stories in the BT-500. A dekko into the high-stakes world of Indian investment banking, dominated by three companies: DSP Merrill Lynch, Kotak Mahindra, and JM Morgan Stanley. B.K. Modi is restructuring ModiCorp so as to make it a pure e-play company. Increasing connectivity and newly-opened markets have boosted the demand for the company�s offerings in India. Here�s how it plans to take advantage. Chairman Ramesh Gelli is trying to use technology to drive his bank�s growth. Haven�t other banks done that already? India�s largest motorbike manufacturer Hero Honda gets ready for life without its joint-venture partner. Gautam Singhania has inherited a diversified business empire striving to regain its focus. But what�s its core competence? After a bitter divorce with partner Piaggio, Deepak Singhania is trying to re-make the scooter manufacturer into a mean motorbikes company. "Big companies will be the biggest beneficiaries of the Net"
GE�s CEO details the fourth and newest growth driver he�s identified after globalisation, services, and six sigma: e-biz. Is the Department of Telecom Services ready for its transformation into a corporate, the Bharat Sanchar Nigam Limited? All you wanted to know about monthly income plan fund-schemes. The truth about co-branded cards. In a stagnant consumer durables market, Total Industries finds its margins shrinking. B.M. Ghodeswar of NITIE, S. Motwani of Godrej-GE, and A. Srinivasa of TSM suggest consolidation strategies. Send us your solution which scrutinises the problems in companies like yours. We'll showcase the best solutions on-line. Yes, we know everyone believes B2B is the only way to be on the Net. It won�t be easy, though, in India. What it takes to succeed in the Indian B2B mall. A McKinsey take. An interview with Jobsahead COO, Alok Mittal; buying consumer durables on the Net; and more happening stuff. The importance of figuring higher in search results, and some insights on how to do it.